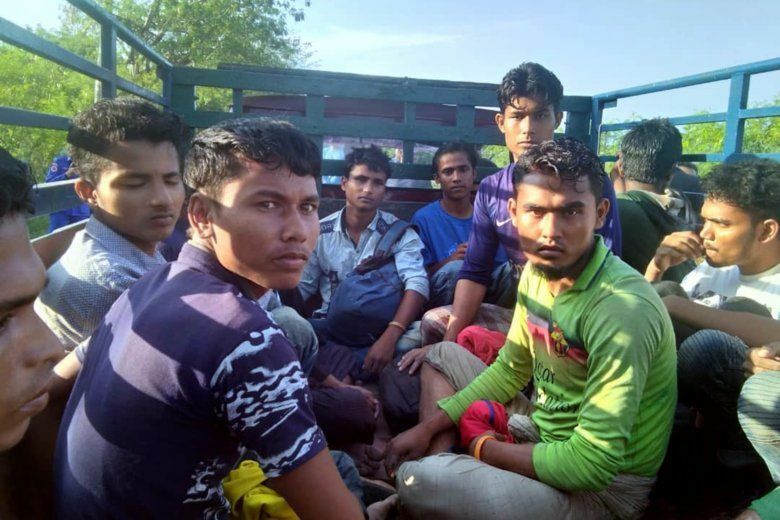 KUALA LUMPUR, Malaysia (AP) — Malaysian police said Monday that 41 Muslim Rohingya men and boys have been detained in the northernmost state of Perlis, the second group to land in the country in just over a month, and that some 200 others are still believed to be at sea. Noor Mushar said one of the men told police that they were part of over 200 Rohingya in a large boat that sailed overnight from Thailand, and that 47 of them were transferred to a smaller boat to Perlis after they paid 4,000 ringgit ($977) each to a trafficker. He said the group walked in mud to reach the beach and subsequently fanned out in smaller groups into the villages when their local agent failed to turn up. Based on the information, he said some 200 Rohingya are believed to still be at sea in Thai waters while six others who landed in Malaysia are missing. More than 700,000 ethnic Rohingya have fled from Myanmar to Bangladesh since August 2017, when a group of militants attacked Myanmar security forces, triggering a massive retaliation by Myanmar’s army. The exodus came after hundreds of thousands of other Rohingya escaped previous bouts of violence and persecution. Myanmar rights groups have said that many Rohingya are also being tricked by traffickers into leaving Bangladesh after being warned they may face death if repatriated to Myanmar. Noor Mushar said the 41 men have been handed over to the immigration department as they have no valid travel documents. He said he would inform his Thai counterparts about the boat believed still at sea at a border cooperation meeting on Thursday. Malaysian authorities are on the lookout for more Rohingya boats entering the country’s waters, Noor Mushar said. Most people in Buddhist-majority Myanmar don’t accept Rohingya Muslims as a native ethnic group. They are instead viewed as having migrated illegally from Bangladesh, though generations of Rohingya have lived in Myanmar. Nearly all have been denied citizenship since 1982 and lack access to education and hospitals. The U.N. General Assembly approved a resolution in December condemning “gross human rights violations and abuses” against Myanmar’s Rohingya. Myanmar’s government denies claims of genocide and ethnic cleansing. The country rejects the U.N. investigators’ work and the General Assembly resolution as biased.